Each day, Downpatrick local William van der Kells heads to Castle Ward, an 18th-century, 332-hectare National Trust property in the dazzling countryside around the burial place of the Irish patron saint. 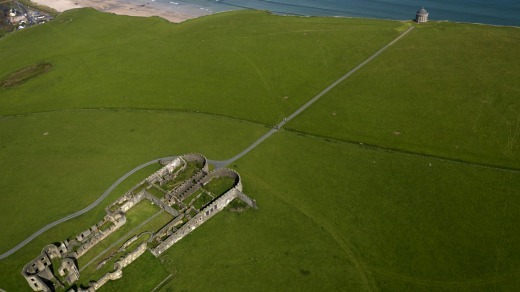 His destination is a traditional stone-walled farmyard in the far reaches of the estate with barns, a tower above huge double wooden gates and a central quadrangle. There he begins his transformation, donning a costume of leather and (faux) fur, a big cape on his shoulders and a sword by his side. 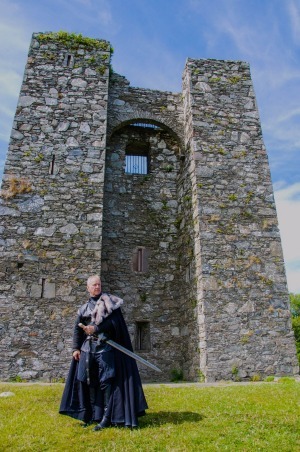 Van der Kells is the "Ned Stark" of Clearsky Adventure Centre's Game of Thrones (GOT) experience. In case you're not one of the millions into the HBO cult phenomenon (more than seven million in the US alone watched the televised finale of season four last year), Eddard "Ned" Stark, the noble Lord Paramount of the North is a pivotal, hugely popular series-one hero. Van der Kells holds his fictional legacy reverently. "We are at all times respectful of the show and mindful of what a privilege HBO have bestowed on us to be able to do this," says van der Kells. Even though he's in full Stark regalia, this is not a Disney kind of scripted experience. (And nor does HBO get any kickback.) It's a guided but free-form exercise that is all about place, rather than people. And very special places for fans these are – the farmyard from which van der Kells works is the location for Winterfell, the GOT home of the Stark clan. There, van der Kells and others lead tour groups – members of which get to wear their own GOT capes – in a range of activities, including trail walks to discover other GOT locations around the estate. Roughly 75 per cent of GOT is filmed in Northern Ireland, either on location or in the Titanic Studios in Belfast. 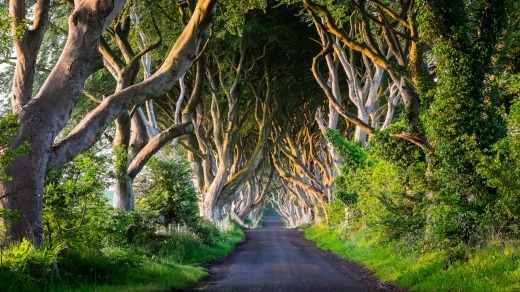 Northern Ireland expects that will increase visitors to more than two million annually by the time the season five finale ends this year, a growth of 200,000 since 2013. That may be conservative. Just after the season finale in 2014, demand for the many GOT bus tours on offer out of Belfast hit a record high. To understand what that means to Northern Ireland, remember the country's international image had for decades been shadowed by the Troubles. Now, once war-torn Belfast sparkles with confidence. Political good will has the most part to do with that. But economic incentives, attracting not just Game of Thrones, but other Hollywood projects too, such as last year's Dracula Untold, has given the already attractive little capital a sheen of glamour. GOT has also alerted the world to a fact the Northern Irish have long known: that their Atlantic coastline is a continuum of spirit-moving beauty. End to end, it's gasp-inducing magic. I'm exploring it clockwise, setting out from Londonderry, to wind around the NI coast to Belfast over three days. There are lots of scenes shot further afield than a half-day bus tour out of Belfast can do, and besides, this happens to be one of the greatest drives in the world, the Causeway Coastal Route. The first leg leads me along the Binevenagh Scenic Route, hugging the west curve of the country's domed northerly coast. It's a clear morning and in one direction there are spectacular views of Donegal, while inland the Antrim Plateau and 60-million-year-old Binevenagh Mountain (a location in GOT series five), stretching over six miles, is a moody backdrop to bucolic sights and the 13th-century St Aidan's Church and holy well. I reach my first stop, Downhill Beach, where in season two, the seven idols of Westeros are burned and Melisandre the Red Priestess proclaims: "The North remembers, for the night is dark and full of terrors." Today the only terrors are lily white bodies in summer sun that comes and goes. Locals have driven their cars onto the vast and rippled tightly packed sand, setting up little wind huts and picnic blankets. 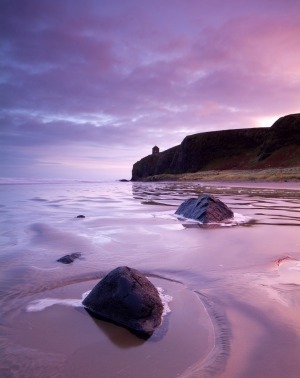 Kids kick balls and play in the shallows, watched over by the cookie jar-shaped Mussenden Temple, an 18th-century folly on the high cliffs surrounding the beach. I push on along coast that transcends superlatives. You could spend weeks at the seaside town of Portstewart alone, doing panoramic cliff walks between villages, exploring the beautiful historic architecture, the ancient ruins, 1000-year-old Dunluce Castle, the barely inhabited beaches, the famed surf and the world-class golf. It's an area laden with sublime attractions, from the man-made glory of the town of Bushmills and the famed distillery, to the natural and remarkable Giant's Causeway, a freakishly mathematical landscape of hexagonal basalt columns thrashed by dramatic North Atlantic Ocean. None of these are on the GOT map, but it would be foolish to skip them. Which I certainly do not. It's late by the time I hole up at the Causeway Hotel, right above the basalt wonders, but being so far north it's light well towards midnight, and light when I arise early to set off again. The porter who helps me get my bags to the car is a GOT devotee. "I wish I was coming with you," he says. I cut inland through verdant Irish farm land to the town of Ballymoney, then further afield to the Dark Hedges, a row of 300-year-old beech trees said to be haunted by a mysterious Grey Lady who weaves through the evocative formation at dusk. But for GOT purposes, this is the place where Arya Stark first appears dressed as a boy on the Kings Road, having just escaped from King's Landing. It's the most photographed of all Northern Ireland's natural wonders and today there are several people adding to the collection of snaps. Back on the coast, I take the skinny, winding road down to Ballintoy Harbour, perilous in itself but also because the stunning views around each bend are distracting. And then comes the rain – in walls. I make it down to the tiny harbour and brave getting out of the car to make a run for the gorgeous little chalk-built teahouse right on the water's edge. Inside this establishment, Roark's Kitchen, there's a huge spread of home-made fruit pies, cakes, buns and sandwiches and a happy throng partaking. I get talking to Harold Morden, a Skagway Alaska-expat author who's called Ballintoy home for decades. "When the Game of Thrones people were here, they blocked the road for no more than a week, but locals weren't allowed down," he says. "Owners had to take their boats out of the harbour, but they were compensated quite well. Then after they'd finished, they left the sets up for a while so we could come down and have a look." The rain finally stops and Ballintoy Harbour reveals itself as a storybook little place, with stone walls, grassy banks full of wildflowers and an Atlantic vista dominated by tiny moss-covered rocky islands. It's the GOT double of Lordsport Harbour in the Iron Islands, the scene of Theon Greyjoy's homecoming and baptism. A couple of German fans take selfies as a tour group in wetsuits and helmets head off for a cave exploration and a group of hikers hit a 20-kilometre amble on beaches, across rocks and cliff top paths from Ballintoy to Bushmills. I head for Larrybane Bay, and wonder if I'll ever get there. It's a short drive, but you could really never make progress at all if you stopped at all the photo opportunities: the quaint pubs, the flower displays and the curious monuments, not to mention the astonishing views. 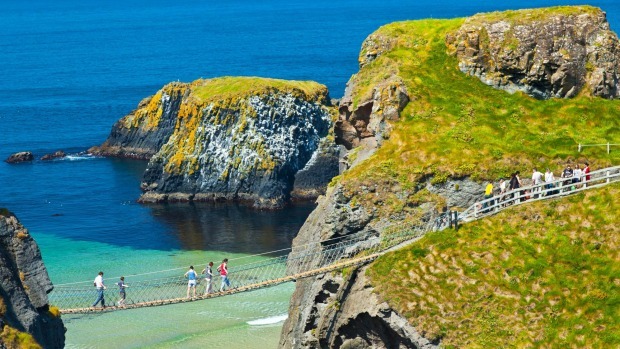 Just as well it's often hard to stop on these curving narrow roads; I do indeed reach Larrybane, where hundreds of people are checking out the Carrick-a-Rede Rope Bridge, a precarious piece of engineering used by salmon fishermen to check their nets. My interest, though, lies out back of the car park and down a hill to a flat clearing with cliffs on one side and another beautiful rocky-island-dotted seascape the other. It's where Lord Renly swears to Lady Stark he will avenge Ned Stark's death, but alas, meets his own end at the hands of Melisandre's shadow baby. Today, there's a GOT tour bus down there. A woman from Philadelphia asks me to take her photo. "I'm totally geeking out on this tour," she says. "Did you come all this way because of Game of Thrones?" I ask. "I came to Belfast on an academic conference," she says, walking away. Then she turns sheepishly and adds, "I left the conference a little early." I take in the view to Fairhead, where Davos Seaworth is shipwrecked after the Battle of Blackwater Bay, then head to the pretty town of Ballycastle, and its award-winning Donnelly's Bakery for a jam bun with fresh cream. 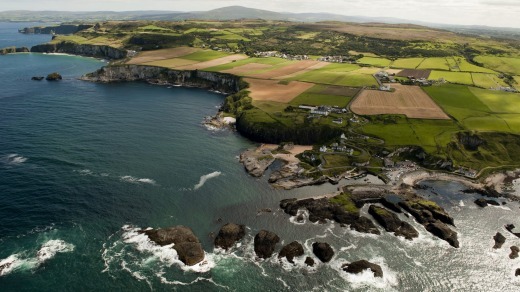 Fortified, I tick the sights off: Cushendun Caves, where Melisandre gives birth to her shadow baby; Glenarm, home of the makers of Joffrey's crown, Steensons Jewellery; and finally a spot called Knockdhu, a basalt escarpment on private property about the little village of Cairncastle. I climb a stile to get a good look at it, and I can almost see Ned Stark, in the very first episode of GOT, beheading the Night's Watch deserter there. It's very beautiful and desolate. I make it to Belfast in time for a fine dinner at Meat Locker at Deanes and a restful sleep at cute little Ten Square Hotel, before starting the morning with a visit to Titanic Belfast and a photo opportunity outside Titanic Studios where a lot of GOT filming takes place. 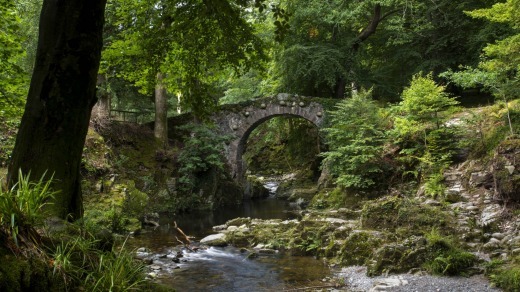 Next, I'm into the countryside in County Down for a GOT cycle tour through Tollymore Forest Park. "You know this is where the night watchmen first see the white walkers and their dead," my companion whispers. I get chills. Then we visit the exact spot where the plot-important direwolf pups are found. It's completely recognisable. Later, I am at Castle Ward and William van der Kells points out the tower as the very same one from which Bran Stark fell in series one, setting off all manner of shenanigans. And then he takes me into a corner of the yard for some archery, right in the spot where Bran fails miserably at the skill and his sister Arya first shows her warrior prowess. I fall into the Bran category at first, but with a bit of gentle coaching from van der Kells, I'm veering into Arya territory. I'm thrilled. Andrew Porter who runs Clearsky comes over to congratulate me on my bow and arrow skills, then explains how it all began: "One day, the people from HBO turned up and told me they were planning on filming and we'd have to shut our activity centre for three months. We would be compensated, but not hugely, they said, but they were confident the ongoing rewards would be plentiful." They weren't wrong. And with the fifth season on the horizon and probably more beyond, Game of Thrones is set to be both Clearsky's and Northern Ireland's gift that just keeps on giving. The writer was a guest of Tourism Ireland. Etihad Airways flies to Belfast via Abu Dhabi. See Etihad.com. The Causeway Hotel; 40 Causeway Road, Bushmills; +44 (0) 28 2073 1210; giants-causeway-hotel.com. Ten Square Hotel; 10 Donegall Square South, Belfast; +44 (0) 28 9024 1001; tensquare.co.uk. Enniskeen Country House Hotel; 98 Bryansford Road, Newcastle, +44 (0) 28 4372 2392; enniskeenhotel.co.uk. Clearsky Adventure Centre's runs various Game of Thrones Filming Location Experiences and plenty more activities in the region. See clearsky-adventure.com. The Mourne Foods & Films Cycle Tour goes through Tollymore Forest and costs $A59 (£30). See enniskeenhotel.co.uk/Mourne-FoodsFilms-CycleTour.html. In the first season, Malta became King's Landing, the capital of the Seven Kingdoms of Westeros. Ancient Mdina, said to be the place St Paul lived after being shipwrecked features, as does 15th-century Fort Ricasoli. Since series two, right up to and including series five, several areas of Croatia have seen GOT crews in action. There's a healthy GOT tour scene there, focused in and around Split. Klis Fortress is the setting for the city-state of Meereen. Shooting moved to the north African country of Morocco for series three. The Red Citadel and Ounila River were the city of Yunkai, while Essaouira became the city of Astapor. Iceland was chosen as the "Land beyond the Wall", the northernmost tip of Westeros. Season two shows Vatnajokull National Park and Svinafellsjokull glacier, while season three utilises Lake Myvatn. Season four features Thingvellir National Park. Series five filming has focused on Seville in Andalucia, with the Alcazar de Sevilla doubling for the Water Palaces of Dorne. Among other locations, there was filming on the Roman bridge in Cordoba.